My name is Jonathan Newman and I am a math teacher at Walkersville High School in Walkersville, MD. I went to college at Wake Forest University in Winston-Salem, North Carolina. After four years of studying I received my B.S. in Math in 2007, and I went on to receive my Masters in Math in 2009 and my Masters in Math Education in 2010. 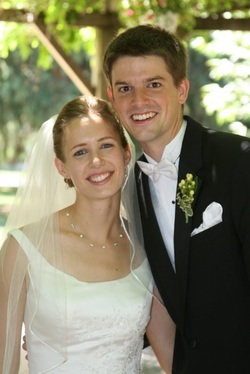 I met my wife, Anna, at Wake Forest and we were married in July 2010. Our first son, Benjamin (Benji), was born on May 21st, 2014. Our second son, Daniel was born August 1st, 2016. I've taught middle school math in NC, high school math and science in NM, and middle school and high school math in MD. I enjoy playing Frisbee, Basketball, Tennis, and Soccer, as well as playing all types of board games, especially Chess and Settlers of Catan. I enjoy reading and am a fan of Harry Potter, Ender's Game, Lord of the Rings, Narnia, and really anything by C.S. Lewis. We attend Redemption City Church and are very involved in the life of our church. My wife, Anna, and I at our wedding, July 3rd, 2010. Benji, our first son, on his first camping trip. Daniel, our second son, going down to the river.